Located at the corner of South Street and Whitehead Street, Key West's most iconic landmark continues to draw in crowds to stand in line for a postcard-like picture with the famous yellow, red, and black painted buoy. Built in 1983, the buoy not only represents the southernmost location in the United States but also its close proximity to Havana, Cuba. No need to take a selfie, the person in line after you will gladly take your picture. Southwinds Motel is just steps away from this popular attraction, perfect for a quick peek at the beloved buoy. Where is the Southernmost Point in the Continental US? Marked by the giant buoy, the Southernmost point of the United States is located at the corner of South Street and Whitehead Street in Key West, Florida. Although the real southernmost point in Florida (as well as in the continental United States) is actually 10 miles away at Ballast Key, a privately-owned island southwest of Key West, that doesn’t allow visitors. How far is the Southernmost Point in the US from Cuba? 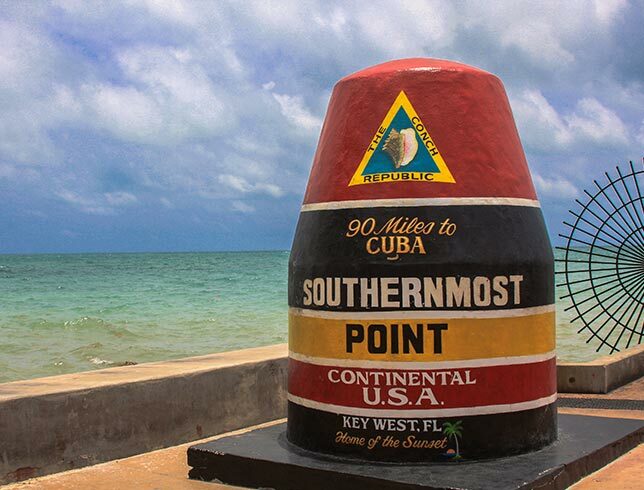 The Southernmost Point landmark buoy is roughly 90 miles north of Havana, Cuba. It is closer to Cuba than it is Miami, Florida. Although this marker is noted as the southernmost point in the Continental US, there are two locations further south that is actually the southernmost point. One is a private island 10 miles from Key West, and the other is in Hawaii. Driving Direction to Southernmost Point in the U.S.